Balinese life is full of traditional rituals, daily offerings, temple ceremonies and jamu (traditional Balinese medicine). Bali is probably the best place on the planet to learn about traditional rituals to care for sensitive skin. I've been going to Bali at least once a year since 2008 and have discovered the many traditions and practitioners that support healthy skin; yes they're tucked away from the tourist crowds. Fresh fruits and vegetables are in abundance in Bali and these will help support our skin via detoxification. The warm climate facilitates doing yoga in fresh tropical breezes which also help the skin detox through gentle sweating. The ancient sacred temples and waterfalls will purify our skin, heart and minds. We'll participate in an ancient fire ceremony led by Balinese Hindu priests to release negative emotional patterns that no longer serve us. There will be daily Yoga for Skin classes, workshops to learn to make our own skin care products to nourish our dry or inflamed skin, as well as a facial and massage using pure local products specifically formulated for those with sensitive skin. The concept of making our own skin care products at home, to keep the irritating ingredients in conventional products out, is trending in Paris; more precisely there's a revolution going on! Despite there being at least three cash register stations in AromaZone's boutique manned around the clock, there are always 10 - 20 persons waiting in each line. People with sensitive skin, and everyone else who just wants safe ingredients in their products, have decided to learn to how to make them on their own. Quite simply, I can't use conventional skin care products made by the global corporations because I have sensitive skin that is prone to eczema and dermatitis. All the synthetic fragrances, and hormone disrupting preservatives in those petroleum-based industrial products make my skin break out. I've learned how to make my own by reading the book about the SLOW COSMETIQUE movement, that was started in French-speaking Europe by Julien Kaibeck. Macerated oils: calendula, black cumin seed, argan, borage, kukui and canarium nut. Floral waters (hydrosols): German (Matricaria) chamomile, true lavender, Damascus rose. Essential oils: German (Matricaria) chamomile, true lavender, ylang-ylang, and black spruce. Ironically, I was in front of the AromaZone yesterday on Earth Day as thousands of climate change awareness supporters paraded by me in response to the Trump administration cutting science budgets and denying research. The fourth step in The Zen Skin Philosophy is to NOURISH SKIN. That means using products that don't contain ingredients that irritate sensitive skin conditions like dermatitis. For an eczema-prone person like me that loves to get spa treatments that's always been a touchy subject. Spas offering facials and massage services may use conventional products that contain irritants. [Sign up for the newsletter and I'll send you the NEVER LIST-The Top 10 Ingredients to Avoid in Skin Care Products for free.] A spa may not be forthcoming about the ingredients in their 'house brand' of massage oil or the exfoliating, cleansing, toning and moisturizing products used during a facial. My goal has always been to find a spa that is transparent about the ingredients used in their products for facials and massages and one that knows how to specifically address the needs of someone with sensitive skin. 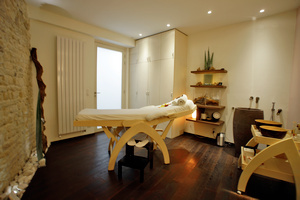 A friend of mine highly recommended La Maison Dr. Hauschka in Paris because of its ambience. Truth be told Vanessa is an interior designer that specializes in Feng Shui and she designed the layout, colors and elements in the spa to create the most Zen-like atmosphere possible. That was great in terms of the Zen Skin Philosophy's principle of Calming the Nervous System, but what about the products? Natural Ingredients, Minimal processing, Free of synthetic fragrances, colors and dyes, No petroleum-derived synthetics (parabens, propylene glycol, silicones), Exclusively non-toxic processing methods (no PEG’s or Sodium Laureth Sulfate), No GMO ingredients, and No irradiation at any stage of production. Once I knew that there were no synthetic ingredients (known to be irritants to those with eczema), I wanted to find out how their spa specifically catered a facial to people with sensitive skin. I booked the Soin Plénitude two hour facial with Emelie. Quite simply she explained that all the products she would use on me were very gentle and designed (and labeled) to be used by persons with atopic dermatitis! Two hours of BLISS! The ambiance in the treatment room, the sounds in the room and smells of all the natural products, Emeilie's soft and precise description of each step along the way; all heaven! I lived in Seattle and then Bali for two years and have had hundreds of spa treatments, this was the best facial experience I've ever had! I don't always like the sales push to buy products once the facial treatments are over (at least that's how most American and European spas operate). Emelie presented me with a list of four products I could use at home that were the same as she used during the treatment. I was shocked to see how affordable they were. (I'd been to the famous/shi-shi Biologique Recherche's L'Ambassade de la Beauté on the Champs-Élysées two other times and there was a hard sales push and each of the recommended products was at least 120€). I bought three products for a total of less than 100€: Cleansing Cream, Soothing Intensive toner treatment for reactive skin, and Ice Plant Face Cream. I've been using this routine for a month at home and my face looks the best its ever been; no reaction to the ingredients at all. I attribute this to the cleanser being 'oil based' instead of detergent based. The philosophy is that like attracts like in the field of chemistry so the oil in the product absorbs the dirty sebum on the face and mimics natural viscosity of naturally produced skin oils. 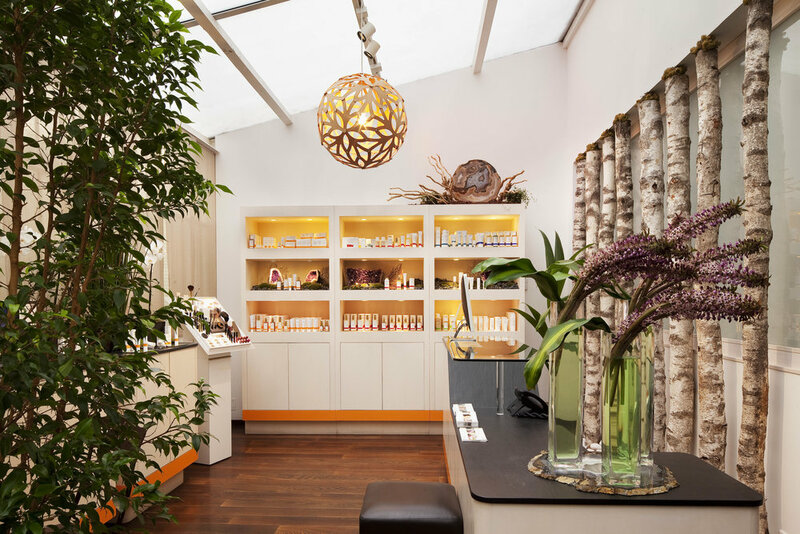 I'm not affiliated with La Maison Dr. Hauschka in any way, but if you're ever in Paris, go there!